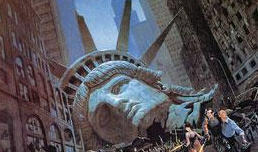 See how you handle a foray into the metropolitan juggernaut that is New Yawk..
1) Complete the 1984 movie title. "The Muppets Take _____"? 6) Which "Die Hard" took place in New York? 2) Where in New York did Eddie Murphy head to, in the 1988 comedy "Coming to America"? 7) What New York building did "King Kong" climb in the 1976 remake? 3) Which movie DIDN'T take place in New York? 8) Which superhero lives in New York? 4) Who did Kurt Russell, as Snake Plissken, head into New York to rescue, in the John Carpenter classic "Escape From New York"? 9) In which movie featured an Oscar-winning performance by an actor playing the character Gordon Gekko? 5) How did Daniel Day-Lewis' character 'Bill the Butcher' disfigure Leonardo DiCaprio, in "Gangs of New York"? 10) Where in New York did Jason get supposedly 'killed', in "Friday the 13th Part VIII: Jason Takes Manhattan"? 11-14) Trouble in New Yawk! 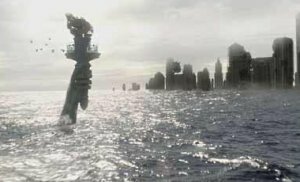 The movies have showered their share of trouble on New York. While of course nothing is ever as terrible as real-life events, it is still interesting to look back at all the peril that has happened to the city on the silver screen. See if you can match the pic to the flick in which the damage occurred. Be warned, as always there are a few red herrings thrown into the pick list, so choose wisely!